As a leading swimming pool contractor in Alamo, Danville, Walnut Creek and surrounding areas, Hawkins Pools provides custom swimming pool design and constructions that reflect home owner’s personality and lifestyle. Hawkins Pools, as a diamond certified swimming pool contractor, pays attention to details, from consultation to swimming pool design and construction. We value high standards of quality design and construction, especially on a significant investment project for the home owners like constructing a new swimming pool. 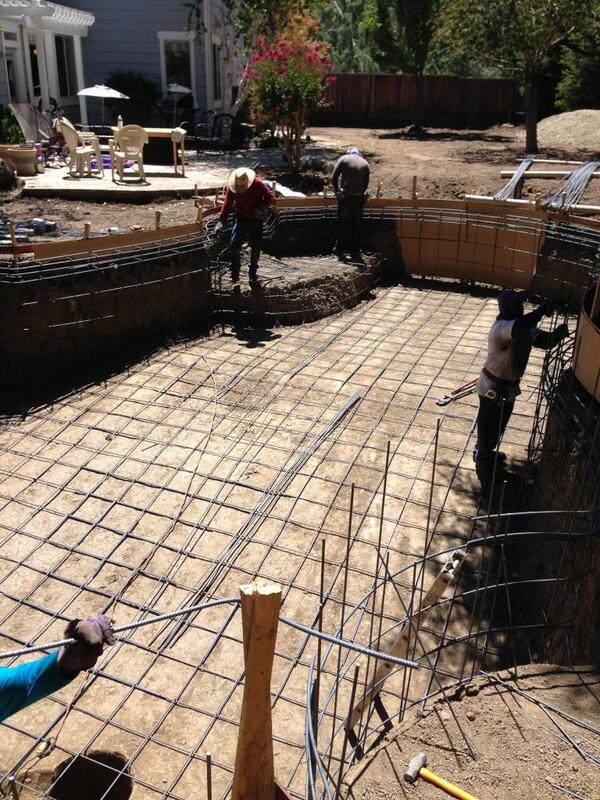 The picture shown is a new swimming pool construction project in Alamo. Note the quality work and the level of detail we put into constructing the swimming pool. Pick the right contractor with extensive experience and reliable. A diamond certified swimming pool contractor, like Hawkins Pools would give the assurance that your swimming pool project can be completed with satisfaction. An experience contractor typically can provide you with more accurate and reliable estimates, which would be very helpful in making investment decisions and managing your project budget. You also want to work with a contractor that can bring design ideas and help consult picking the right size, type and materials that fit into your budget. Pool type. One popular type is concrete pool. It is custom-built and can be formed to various size and shape. These types of pools are often called gunite pools because concrete is shot from a gun onto steel-reinforced walls, just like the picture shown for our swimming pool project in Alamo. Then it is plastered smooth, painted, finished with a textured aggregate surface or tiled. Other type of pools include vinyl and fiberglass. Discuss with your contractor on what the best type of pool for your home. Consider zoning and local regulations. In-ground swimming pools are typically subject to building and zoning regulations just like any other home-improvement project. Work with your contractor to apply for the necessary permit, prepare for HOA approvals and other requirements before begin working on your swimming pool project. It is very important to pick the appropriate spot for your in-ground pool. An experienced pool contractor can provide valuable insight, such as a site to let the sun shine in, to you can take advantage of free solar energy to heat the pool. Another point is to find a spot that is away from trees, so you can reduce the number of leaves that drop into the pool. Building a pool on the hill location can be breezy. A windy location on the hill can greatly increases water evaporation from your swimming pool, and can also make you uncomfortably cool when wet. Find a spot that can block some of the wind. Other site considerations include low vs. high area, clearance from high wires and sewer lines, within view from the house for safety, accessories placement, etc. There are many other factors that an experience swimming pool contractor can help you setup the pool with all the necessary accessories where you can enjoy your pool for many years. Visit our gallery to see more swimming pool design and construction completed by Hawkins Pools. Also, read more about Hawkins Pools featured in Houzz.